A hazy photo like this is trivially easy to correct with GIMP. Haze and color casts in photographs can ruin a good photo; fortunately, they are trivially easy to correct with GIMP, the foremost open-source photo editing software. Here's how. 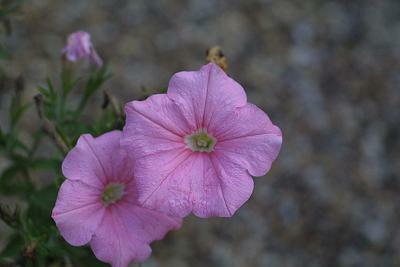 Sometimes automatic white balance will fix the problem; other times, it will have strange effects like this. 1. Try the easy way first. Go to the Colors | Auto | White Balance menu. More often than not, this will fix haziness and color casts sufficiently well. The rest of this article is only relevant if this has unusual effects. 2. Bring up the Levels dialog with the menu Colors | Levels. "Dead" spots in the histogram, to the left and right, are usually indicative of hazing. 3. Observe the "dead spots" in the histogram. 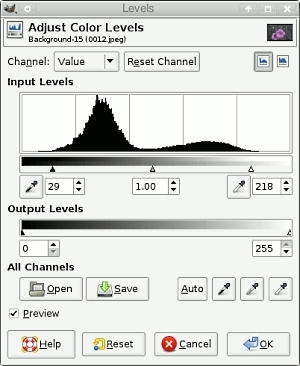 The histogram will show areas on the left and right which are "flat-lined", or close to it. Move the sliding arrow on the left past the dead spot on the left, and likewise for the arrow on the right. If there are colour casts on the image (e.g. if the original has, for example, a red haze) then don't hit OK yet; go on to the next step).